Like the Mary Oliver poem, I want to live life as a bride married to amazement. And I love to share that amazement with my children, stretching the boundaries of their reality this way and that. Plus they're easier to impress than my husband! 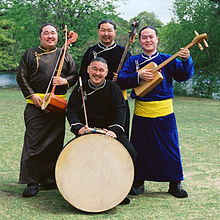 Image from Wikipedia's page on throat singing. Their music was strange and exotic. There were whistling and low, vibrating sounds, and I believe the odd realistic horse whinny. Then I started wondering where the whistling was coming from... they all had their mouths open. NO! They were whistling with open mouths! We bought their CD and promptly lost it, and I never heard that sound again until I searched for it on YouTube recently. I was amazed again. I hadn't realised that the same singer doing the open-mouth whistling was simultaneously making the very low sound! Furthermore, when women do it, it sounds exactly the same as when men do it! The children were fascinated. There are many videos of traditional men doing it, but I particularly enjoyed hearing this normal western bloke who's mastered it (perhaps because he is unaccompanied and therefore it's completely clear that he's making all the sounds himself) and this Mongolian woman. It's very hard to believe such a low sound could come out of any woman's mouth, let alone an eerie whistle at the same time.